DESCRIPTION FROM THE PUBLISHER: Every day, thousands of farmworkers harvested the food that ended up on kitchen tables all over the country. But at the end of the day, when the workers sat down to eat, there were only beans on their own tables. Then Dolores Huerta and Cesar Chavez teamed up. Together they motivated the workers to fight for their rights and, in the process, changed history. Award-winning author Monica Brown and acclaimed illustrator Joe Cepeda join together to create this stunning tribute to two of the most influential people of the twentieth century. MY TWO CENTS: Growing up, my mother told us we had to boycott grapes. At that time, I only understood farmworkers were treated badly and Cesar Chavez was helping them. 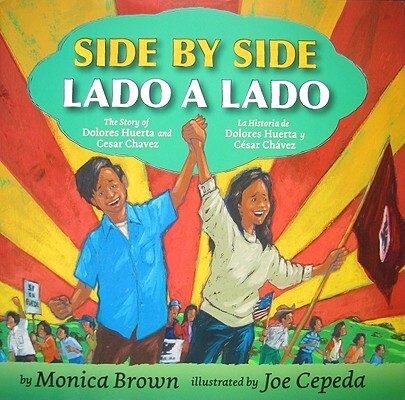 Years later, I’ve found a bilingual children’s book that would have helped me understand, not only the history of the farmworker movement, but who Cesar Chavez was and how he and Dolores Huerta worked together to inspire a national consciousness about the treatment of farmworkers. I love that this book introduces Dolores and Cesar as children and connects their early life experiences to the decisions they made as they grew up. I value the discussion of poverty, which the author introduces by explaining that Cesar’s family ended up working as migrant farmworkers after they lost their home. Given the shame and confusion children are apt to feel when their family faces eviction and/or loss of a home, the book offers an important perspective on family displacement by following Cesar throughout the loss, showing how it impacted his life as an activist for human dignity. It also does a good job of showing how a teacher, Dolores Huerta, became a social justice leader, adding a texture and dimension to those in the teaching profession that students might not otherwise get an opportunity to witness. The illustrations by Jose Cepeda really welcome readers into the story and younger children will be engaged visually. His illustrations are lively and are reminiscent of comic book characters. I learned several things about the early lives of Caesar and Dolores that enriched my understanding of them as people and about the farmworker movement, so while the book is focused on ages four to eight, I suspect adults will learn something new as well. Given that I longed for bilingual children’s books when my two sons were growing up, I only wish I had known about this book earlier. I applaud our local library for having a copy on display and bringing it to my attention. TEACHING TIPS: The story offers educators the chance to engage their students in discussions about social justice. While there are many ways to talk about how and why people have to fight for human rights, this book offers a slice of American history that has resonance with contemporary issues related to the working and living conditions of the people who grow and pick our fruits and vegetables. Teachers might even bring in some fruit or veggies and ask children to think about how it ended up at the supermarket or fruit stand. Making a connection between planting, cultivating, growing, harvesting, marketing, and shipping and the human beings behind each step could be a valuable lesson on introductory economics. What makes people act in a mean way? Why are people mean to some and not to others? What happens when you are on the receiving end of someone who is mean? What if the person being mean has power over you (e.g. boss, police officer, parent)? Children know about these issues first-hand, and I’d suspect they’d have amazing insights. I also see Side by Side being used to talk about work and career. So many adults ask kids what they want to be when they grow up, and that pressure can make kids feel like they have to provide an acceptable response. This book provides insights into how your calling can find you. It also shows how one’s chosen profession, teacher in Dolores’s Huerta’s case, can morph, grow, expand and change over time. The book offers a wonderful opportunity to explore friendship. By highlighting the platonic partnership and bond between a man and woman working toward a common vision, it shows a model of what two people can do when they unite. The idea of strength in numbers or working in pairs can be explored by asking students about the benefits of working with someone else on a school project or a sports team. The book can also be used to discuss feminism. Many people think about Cesar Chavez’s connection to the farmworker movement. This book highlights Dolores Huerta’s work as a bold and fearless leader in her own right. She is an important role model for girls, displaying courage, skills to inspire and mobilize, and political savvy. For lessons that focus on women in American History, she would be a great person to showcase. Finally, because so much of the telling of history has to do with who is telling the story, Side by Side provides a perspective on history that departs from the dominant culture’s narrative on landowning, California’s natural agricultural bounty, modernization, and unionization. I’d recommend reading the Note for Parents and Teachers at the back of the book to gain more context and facts about Cesar Chavez and Dolores Huerta. WHERE TO GET IT: To find Side by Side / Lado a Lado, check your local public library, your local bookstore, or IndieBound. Also, check out Goodreads, Amazon, and Barnes & Noble. 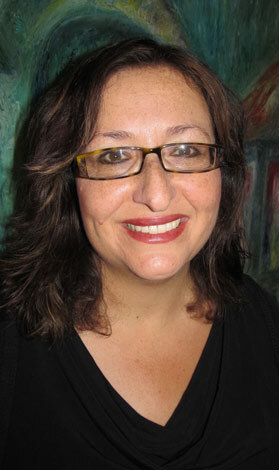 ABOUT THE AUTHOR: Monica Brown, Ph.D. is the author of many award-winning books for children, including Waiting for the Biblioburro, Marisol McDonald Doesn’t Match/ Marisol McDonald no combina The Lola Levine series including: Lola Levine is Not Mean! ; Lola Levine, Drama Queen; Lola Levine and the Ballet Scheme, and Lola Levine Meets Jelly and Bean. Find Monica on Facebook at Monica Brown, Children’s Author, on twitter @monicabrownbks, or online at www.monicabrown.net. For other posts about Monica Brown, click here and here. ABOUT THE ILLUSTRATOR: Joe Cepeda is an award-winning illustrator of children’s books who also works in magazine illustration. He lives in California and serves as president of the Society of Illustrators of Los Angeles. For more information, visit his website. Joe Cepeda did a two-part interview with us about his work. To read those posts, click here and then here.